Northwest Missouri State head football coach Mel Tjeerdsma has been named a regional coach of the year as selected by the American Football Coaches’ Association (AFCA). It’s the seventh such honor for Tjeerdsma, who earned the award five times from 1996-2000 and most recently in 2006. Nebraska’s Bob Devaney is the only other coach to win district/regional coach of the year honors in five consecutive years. Division III Mount Union’s Larry Kehres (13), Division I Penn State’s Joe Paterno (11) and Division II Bloomsburg’s Danny Hale (10) are the only coaches to earn more regional coach of the year awards than Tjeerdsma. Joining Tjeerdsma as Division II regional winners are Hale and John Luckhardt (California (Pa.)), who tied for the region 1 award, Frankie DeBusk (Tusculum) from region 2, Chris Thomsen (Abilene Christian) from region 4 and Dan McLaughlin (Wayne State) from region 5. The Division II National Coach of the Year will be announced at the 2009 AFCA Convention in Nashville, Tenn. Tjeerdsma was named AFCA National Coach of the Year following both of his national championship seasons in 1998 and 1999. This year’s Bearcats are 13-1 and headed to the national championship game for the fourth year in a row. Northwest won its third-consecutive MIAA championship with a 9-0 record and has won its last 28 games in conference play. Among his peers in Division II, Tjeerdsma ranks fourth on the active wins list (216) and with the seventh-best win percentage (.734). 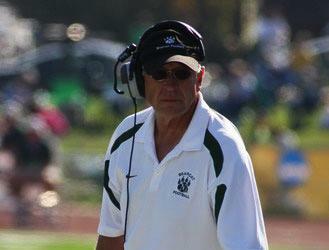 His 216 wins are the 10 th -most in Division II history. Four more wins will place him in a tie for seventh place on that list. Tjeerdsma has more postseason wins than any other coach in Division II history. He’s led Northwest to the playoffs 11 times in the last 13 seasons and sports a 25-8 postseason record. The 2008 Bearcats became the 13 th team in program history to go unbeaten in MIAA play. Eight teams under Tjeerdsma have finished 9-0 in league play since 1997.